Bitter winter winds pushing them forward, the Humane Officers stepped gingerly around the corpses of ponies and chickens as they searched desperately for signs of life. Out of the corner of her eye, one of the officers saw movement. Was it the wind, or was there an animal hiding in that old cardboard box? She made her way closer and peeked in to find a terrified pig, too weak to scream or run. In the barn, they found a second pig who was much less frightened. 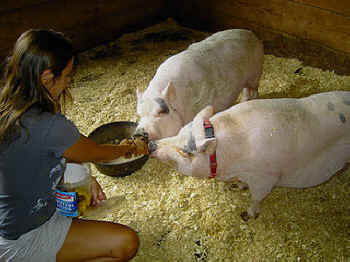 The pigs, Magdalena and Anunzio, arrived at Indraloka Animal Sanctuary in early March, 2007. Having miraculously escaped their living nightmare, Magdie embraced us, immediately becoming the affectionate and playful pig that she is today. Nunzi took a different approach. He screamed at the top of his lungs every time he saw a human. This means that every time we fed him, gave him fresh water, cleaned his stall, or did anything else in the barn, he screamed the entire time. 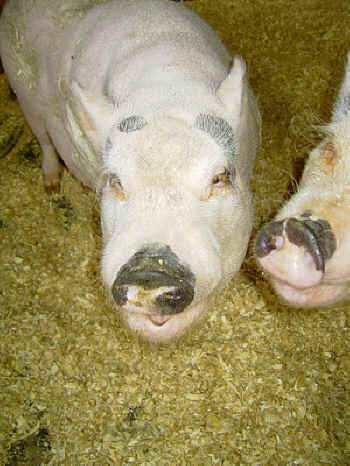 In case you do not know any pigs, their scream is actually a higher decibel than a jet engine. Quickly, we discovered that speaking to him, even in a soothing, soft tone of voice, only terrified him more. Happily, he was never afraid of Magdie, so at least he had a companion. To this day they remain gentle, loving best friends to one another. One day, I found myself singing in the barn as I worked (it happens sometimes, although it is not pretty, I admit). I realized at some point that Nunzi was not screaming. Slowly and silently, I poked my head into his stall -- "What if something is wrong with him?" I worried. As my head came into view, Nunzi resumed his deafening screams. "At least he is all right physically," I thought, and went back to my barn work. As I resumed singing, his screams ceased. When I stopped, the screams resumed! So, I made it my habit to sing in Nunzi's presence, and he stopped screaming when he saw me. This was a breakthrough. From there we began, very slowly, to work on building a friendship. Blue moon, you saw me standing alone, Without a love in my heart, Without a pig of my own. Blue moon, You knew just what I was there for, You heard me saying a prayer for, Some pig I truly could care for. Fast forward 9 months, to a sunny Sunday morning. I went out to the paddock to see how Nunzi and his pig, horse, turkey, and rooster companions were enjoying the morning sun. Nunzi heard me talking to Sabine (a horse) from around the corner of the barn and...are you ready?... (drum roll, please...) Nunzi actually ran to greet me, grunting softly and contentedly as he nuzzled my hand. His eyes twinkling, he practically said in English, "Well, and good morning to you too, sunshine. So nice to see you this morning." Nunzi doesn't scream at humans anymore. And that makes all of the endless hours, backbreaking work, struggles to pay vet, feed, and hay bills, and everything else worthwhile. 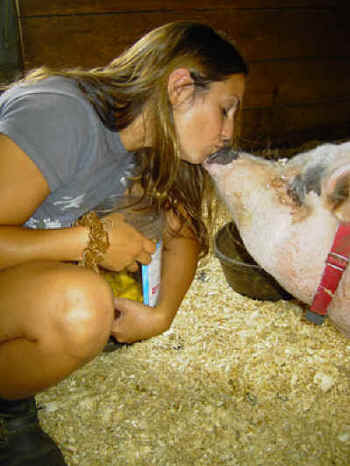 Indra is the founder of Indraloka Animal Sanctuary, Pennsylvania, an all-species safe haven for animals that would otherwise have been euthanized or slaughtered. Indraloka is founded on two principles: 1) the earth itself and all life are sacred and 2) we are all related. Indraloka supports animal rescue groups by providing a lifetime home for animals that are otherwise unadoptable, and also rescues farm animals from cruelty. Indra has dedicated her life to helping previously traumatized animals heal and rediscover joy, love, and trust. In the process, the animals she set out to help have become her greatest healers and teachers.